The Other Side blog: Mega-Dungeon! 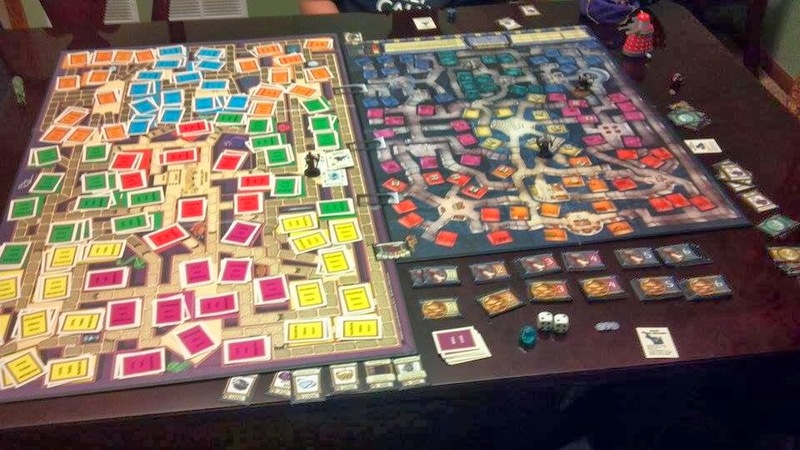 We are big fans of the board game Dungeon around here. My kids love to play it and have even gotten their non-gaming cousins into it. I have several copies including two copies of the original 1975 version in slightly different boxes. So last night we tried something we have been wanting to try for a while: Mega Dungeon. We decided that there are secret doors between the two dungeons and you can teleport from any chamber to any other chamber. Wizards get twice the amount of spells and magic swords can "stack" so if you have a +1 and a +2 sword then you have +3. We also used minis instead of pawns cause that is more fun. The monster rolls are on a d12 instead of a 2d6. A roll of "1" means the player gets another attack. We also require twice the amount of gold to win. So far it has been a lot of fun. We are continuing later today. We used to play Risk with three boards by connecting Australia to South America. Triple the armies when you turn in cards. Led to long games (not sure if we ever actually finished), but seeing someone dump 120 armies on one region and launch an attack that crosses from one board, clear across a second entire board and onto a third is kind of cool. I've always had a soft spot for fan-alterations to board games, especially ones that add additional layers of complexity to play. It's a great example of how you can interact with a game rather than just playing it.